1,002 days have passed since Britons voted to leave the EU in a referendum that, before Donald Trump's electoral triumph, stood as the most strident populist repudiation of the globalist world order. Yet after nearly three years of frenzied negotiations, the UK and the EU haven't managed to agree upon a deal. So what difference could another two weeks possibly make? Well, we're about to find out. With the Conservative Party in shambles, backbenchers on the brink of rebellion and cabinet members leaking stories about her impending ouster as prime minister, Theresa May has at least managed to convince the EU27 after another day of harrowing negotiations in Brussels - which produced a flurry of headlines on the rumors before a final decision was announced by European Council President Donald Tusk - to give her just a little more time to give her widely loathed withdrawal agreement one more go in the Commons (it has already been defeated twice by historic margins). Specifically, Tusk revealed that the EU had authorized a two week 'unconditional' delay, with another six weeks on the table should May manage to pass the withdrawal agreement (which has already been defeated twice by historic margins, and which the EU has insisted will not be modified in any meaningful way). 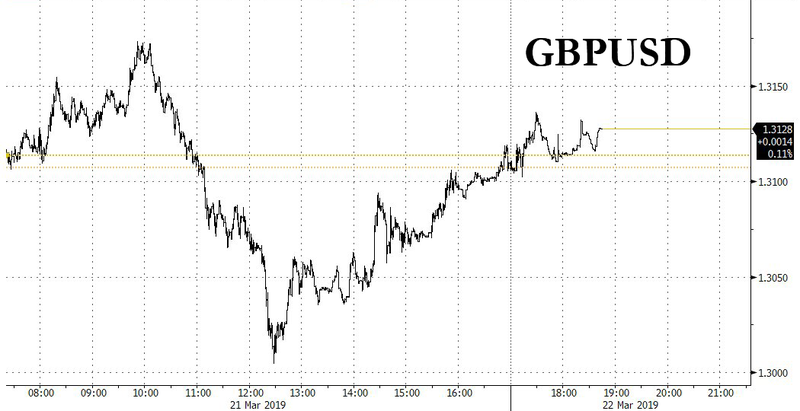 Following what amounted to the first real hint of optimism (however meager) all week, the pound has rebounded off the session lows. Intransigent Brexiteers and members of the pivotal DUP - the Northern Irish party that has effectively held the Tories hostage with its opposition to May's deal - have already insisted that they won't budge. So, with the final countdown under way, can May forge a deal for a 'softer' Brexit with Labour? Or will she just go ahead and resign?